If you own a Nintendo product and want to take it apart, you may be wondering, “Can I get a tri wing screwdriver locally?”. The short answer is “probably not”. They are certainly not available at any of the big box retailers. Independent hardware stores are also very unlikely to carry them as they are used almost exclusively on Nintendo products. An independent electronics repair shop may have a few for their own use, but it is pretty unlikely that they have them for sale. So now you are facing a decision. Do you order one here and wait a just a few days for it to arrive, or do you try to improvise? Anyone who is comfortable making their own repairs or modifications to something like a Nintendo product probably has the skills necessary to improvise a tool to remove the tri wing screws. There are many locally available options that people have tried. Small flat blade screwdrivers, modified Phillips screwdrivers and melted BIC pens are the most popular options and they have all yielded some degree of success. The small flat blade screwdriver is the easiest to try. The only trick is finding one that is small enough to fit into the center part of the Y-shaped recess in the tri wing screw. After that, it is simply a matter of applying enough force to turn the screw without overdoing it and causing the screwdriver to slip out. The biggest drawback to this method is that the screwdrivers that are small enough to fit are not strong enough to handle the task. It is likely that the screwdriver will be damaged after removing only a few screws. 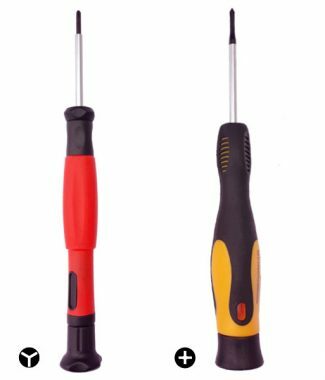 The modified Phillips screwdriver is another method that is used to improvise a tri wing screwdriver. The only step of the modification is to remove one wing of the Phillips screwdriver so that it is T-shaped rather than cross-shaped. The resulting “T” must be small enough to fit into the center part of the Y-shaped recess in the tri wing screw. Since the fit is less than perfect, expect this screwdriver to strip screws easily. Once a screw is stripped, removal by any means becomes very difficult. The last type of improvised tri wing screwdriver is the melted BIC pen. This method works reasonably well for some types of screws, but is a very poor method for trying to remove tri wing screws. The basic method is to heat the end of a BIC ball point pen until the plastic is soft. Once the plastic is soft enough, the pen is pressed into the head of the screw and is held there until the soft plastic returns to its harder state. The result is a plastic mold of the screw recess. The pen is then used as a screwdriver. 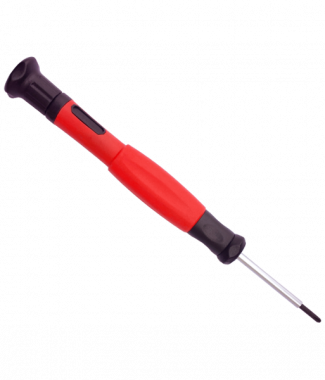 It is a weak screwdriver and usually can not handle the torque needed to remove the screws. The best method for removing tri wing screws is to use the correct tool for the job. Tri wing screwdrivers are not usually found locally, but they are easily purchased here. Our shipping is always fast and free.